I should mention, for newer readers, that these “Things I’ve seen” posts are made up of photos I’ve taken of things that didn’t fit into other posts, usually because the other posts were already far too long. Quite often I end up with too many photos to fit in one post but I don’t want to waste them, so here they are. 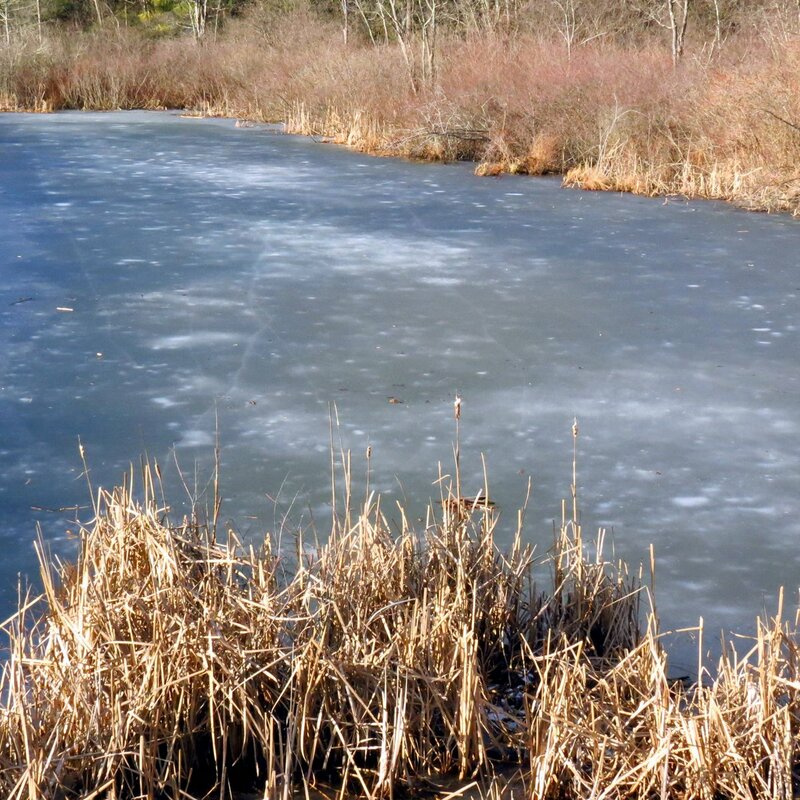 The pond in this shot shows very well what “rotten ice” looks like. Specks of dirt and bubbles get between the ice crystal bonds and weaken their strength, and when it looks like this, with a dark matte finish, you certainly don’t want to walk on it. Of course this was taken when we had a warm spell. The ice has firmed up now and is covered with about 6 inches of snow. The pond in the previous photo connects to a swamp by way of a culvert under a road and beavers use it to travel back and forth, stopping long enough to cut some trees on the way. 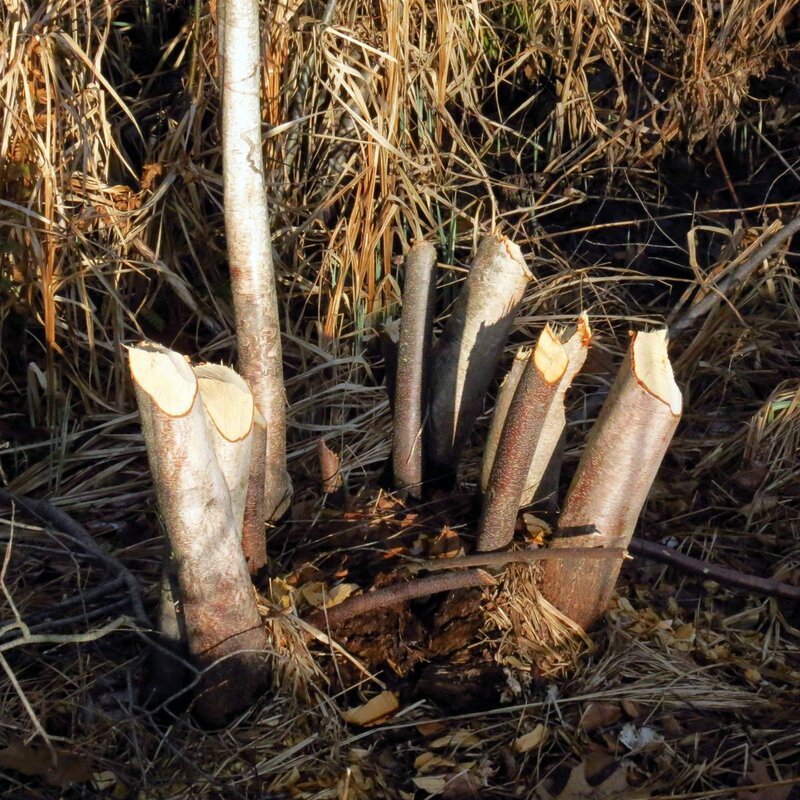 The beavers have been very active here this year and have cut many young birch trees in this area. 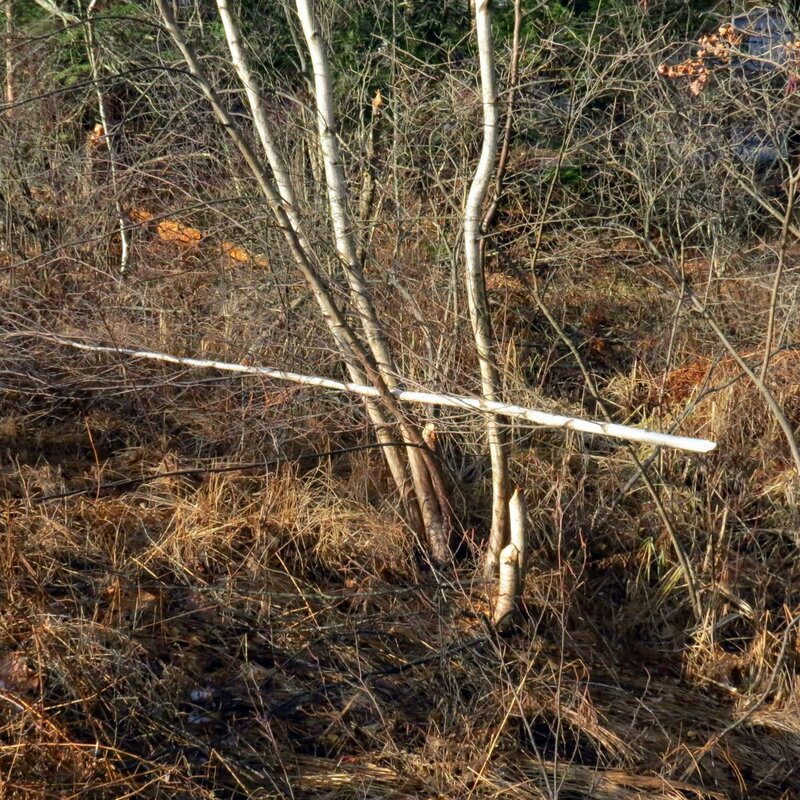 They do this every few years and then cut somewhere else, giving the birches time to grow back. I’ve seen these clumps grow back at least twice in the 30 years or so that I’ve paid attention. You know you’re seeing some strange weather when a tree drips sap in January. 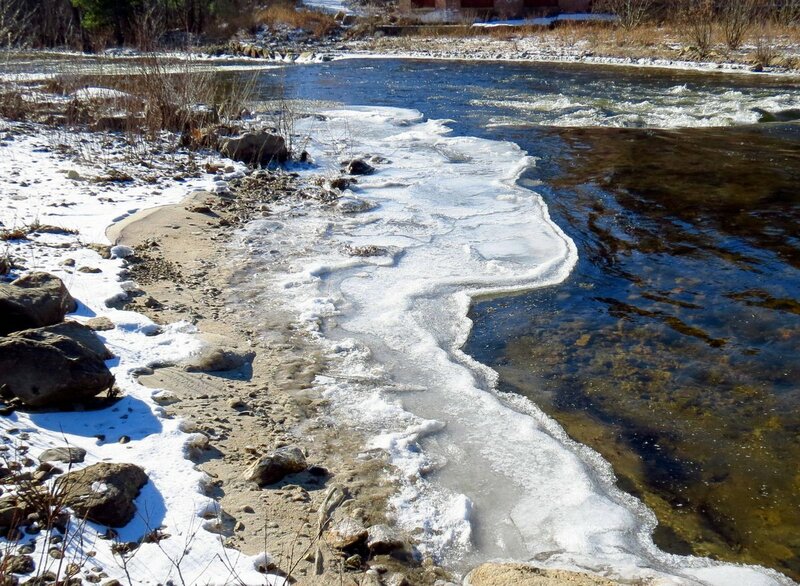 But then it got cold; cold enough to grow ice shelves on the Ashuelot River. How enticing they are to pig headed little boys who don’t like to listen to their elders. I know that because I was one of those once, and I walked right down the middle of the frozen river. All of the sudden I heard what sounded like rifle shots and I ran as fast as I could for the river bank. 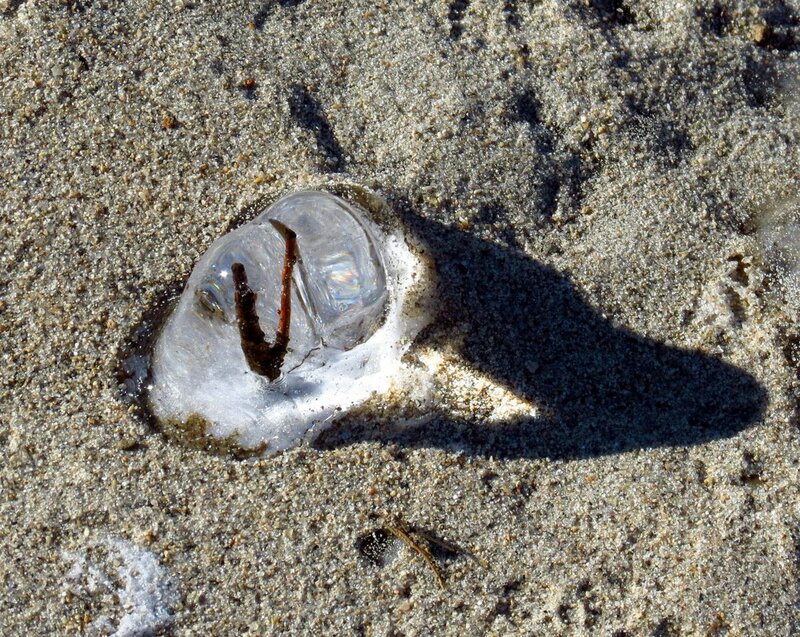 When I was able to peel myself from the tree I had a death grip on and take a look, I saw water where I had been walking. It scared me more than anything else ever has I think, and I doubt I’ll ever forget it. 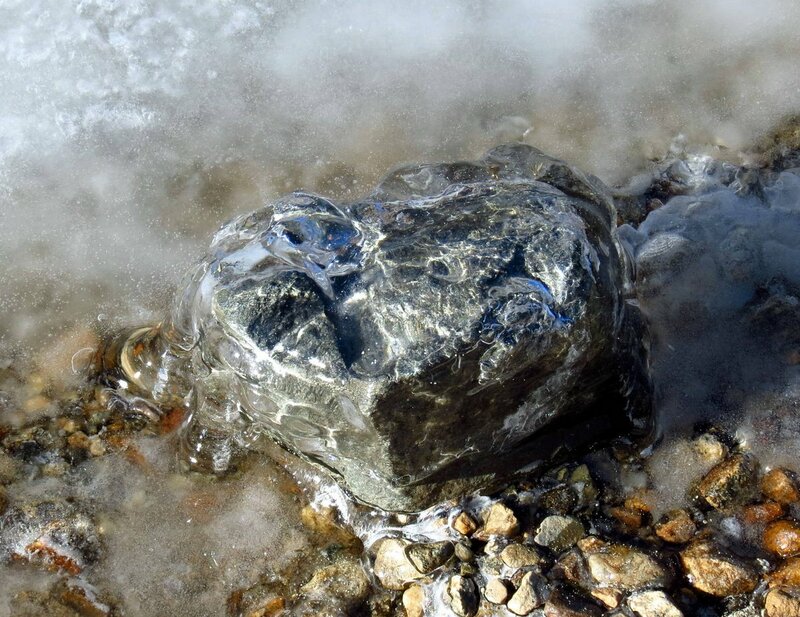 Even the stones were coated with ice. 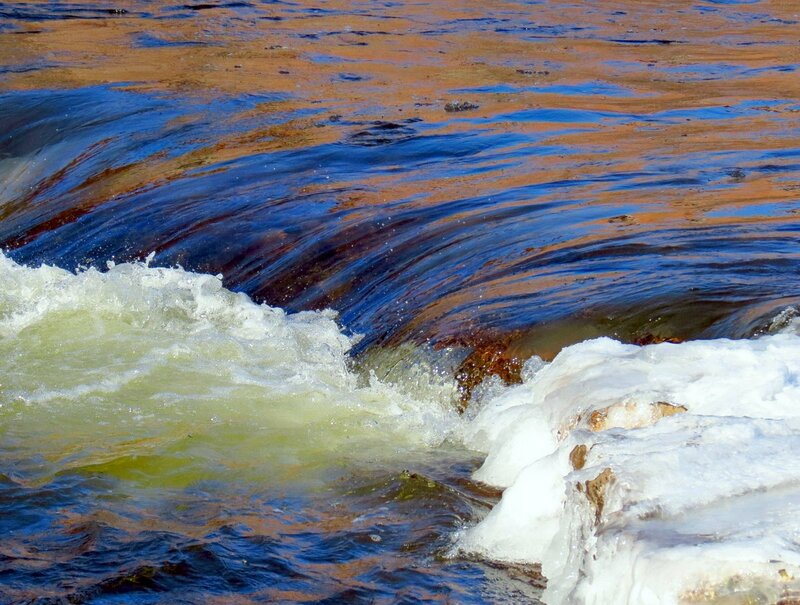 The Ashuelot was tame on this day and there were no waves to take photos of. 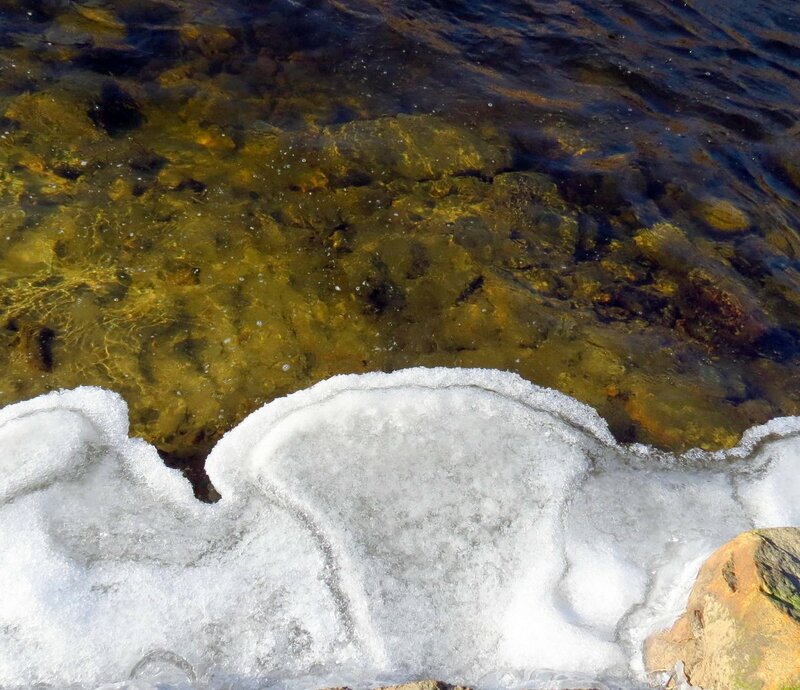 The river had coughed up an ice bauble which caught the sunshine but didn’t melt. I’m always surprised by how clear river ice is. This bauble was so clear I could see a V shaped something frozen inside it. Jelly fungi are made almost entirely water so of course they were frozen too. 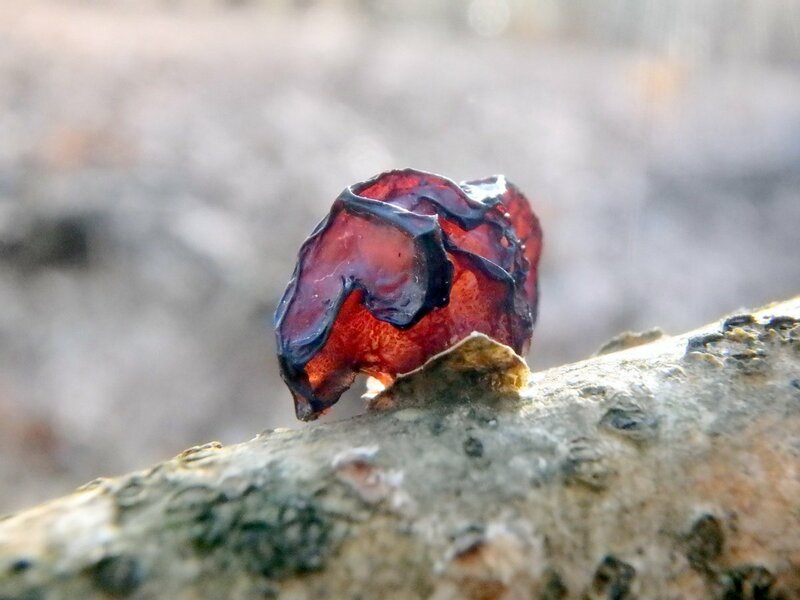 This amber example felt like an ice cube rather than an earlobe as they usually do. Freezing doesn’t seem to affect them much, I’ve noticed. 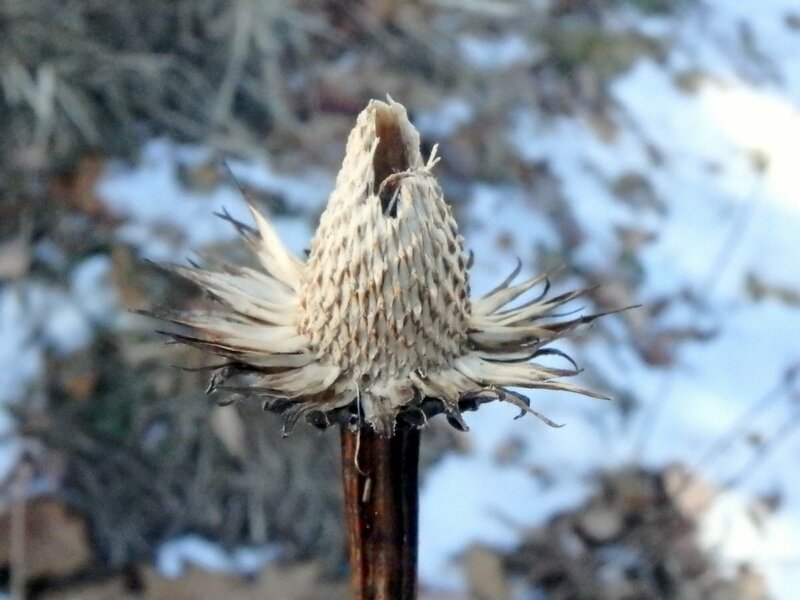 The seed eating birds have been busy picking all the prickly looking coneflower seeds in my yard. They had just gotten started on this one. And they had just about finished with this one. 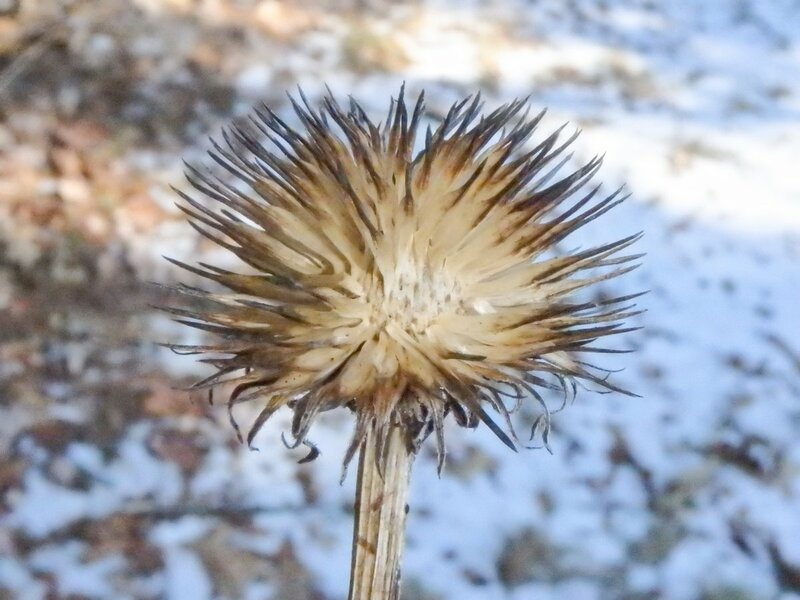 Odd that these seed heads are hollow. 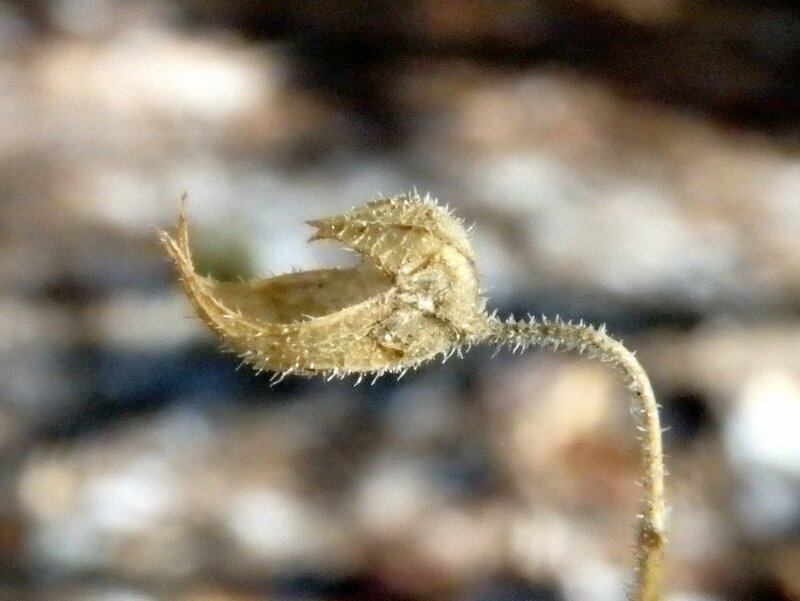 I don’t know if birds eat the tiny seeds of forked blue curls (Trichostema dichotomum) but the seed pods look almost like a trough that would make them easy to reach. I can’t remember this pretty little annual plant having such hairy parts in life but they certainly do in death. 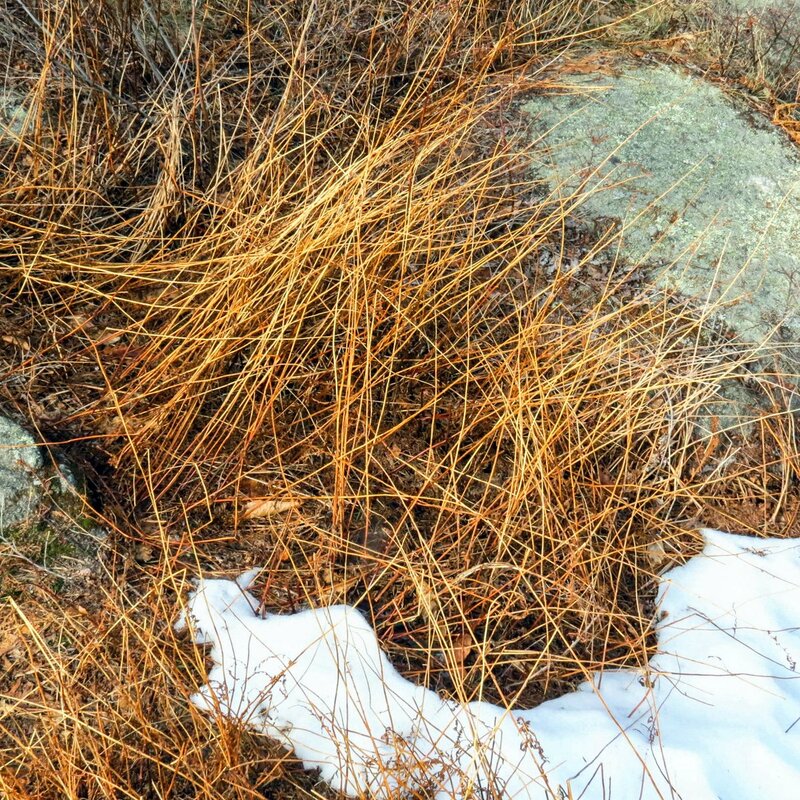 I thought the color of these dead fern stems (Rachis) was very beautiful on a winter day. I think they might have been hay scented fern (Dennstaedtia punctilobula,) which grow in large colonies and have stems that persist long after the leaves have fallen. Many things are as beautiful in death as they are in life, especially fungi. I don’t know if I’d go so far as to call this one beautiful but it was certainly interesting. 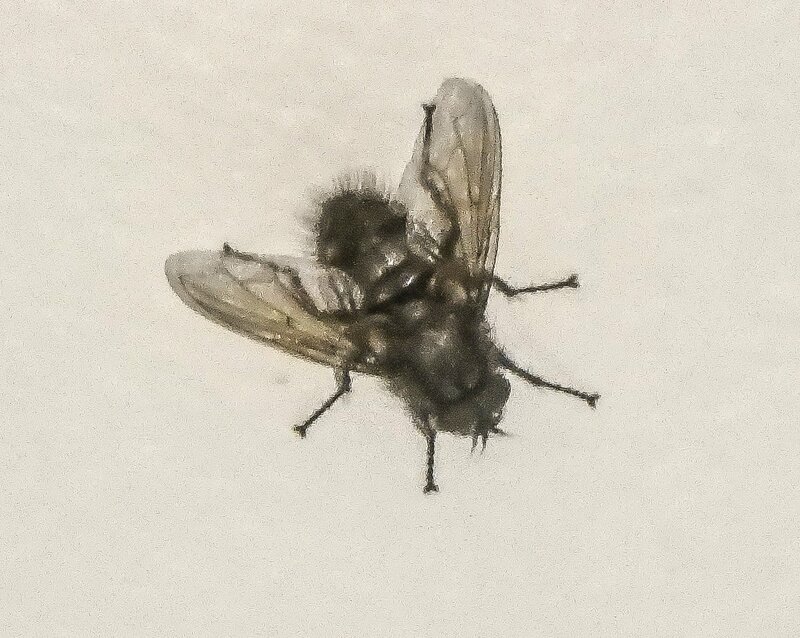 This isn’t a very good photo but it does help illustrate how strange our weather has been, because you don’t see too many flies flying around in January in New Hampshire. Last Tuesday it was -13 degrees F. and everything was frozen solid. By Thursday it was 50 degrees; warm enough apparently to awaken this fly. It was also warm enough to cause an unusual snow slide in Claremont, which is north of here. A large amount of snow suddenly slid down a hillside and slammed into a house, partially destroying it. It also pushed a parked truck about 75 feet. 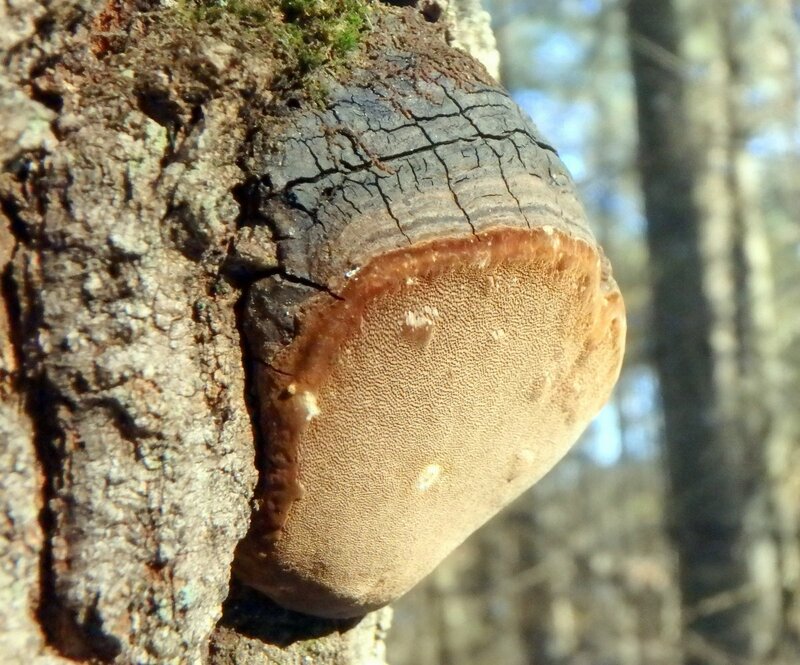 It’s easy to see how the horse hoof fungus (Fomes fomentarius) got its name. It’s also easy to see how this fungus grows, because its spore bearing surface always points toward the ground. 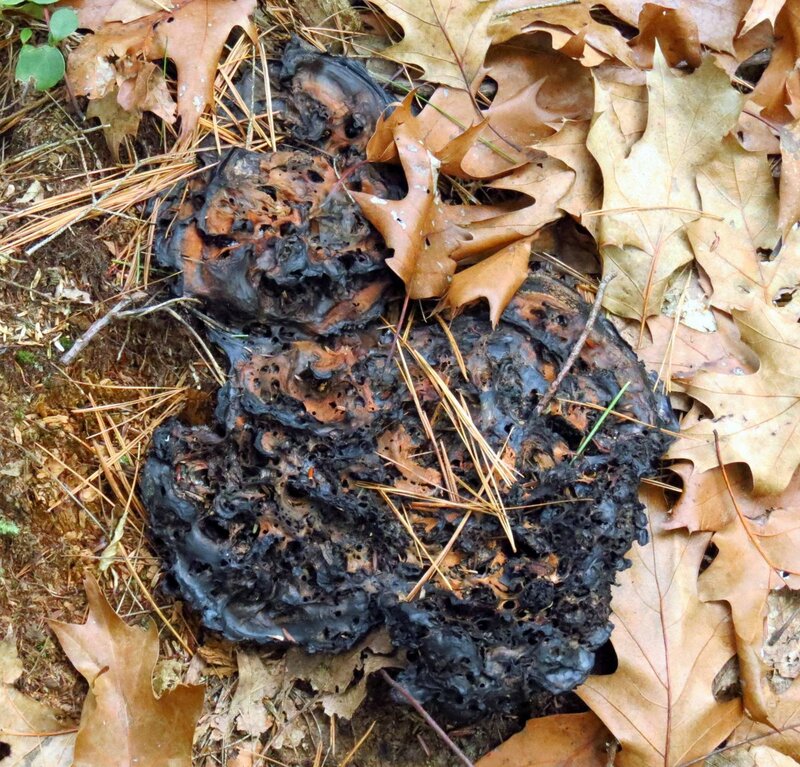 If you see a fallen log with this fungus on it and its spore bearing surface doesn’t point toward the ground you know that it grew while the tree was standing. If it does point toward the ground it grew after the tree fell. This bracket fungus produces spores at all times of year but through spring and summer studies have shown that it can produce as many as 800 million in a single hour; fine as dust and nearly impossible to see. 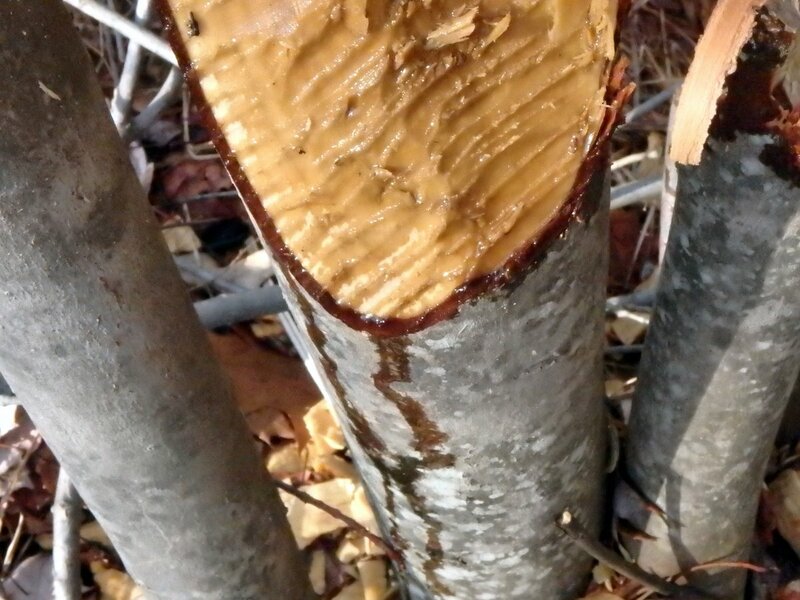 The fungus is also known for its ability to stop bleeding and was recommended for that purpose by Hippocrates, who is considered the father of medicine. 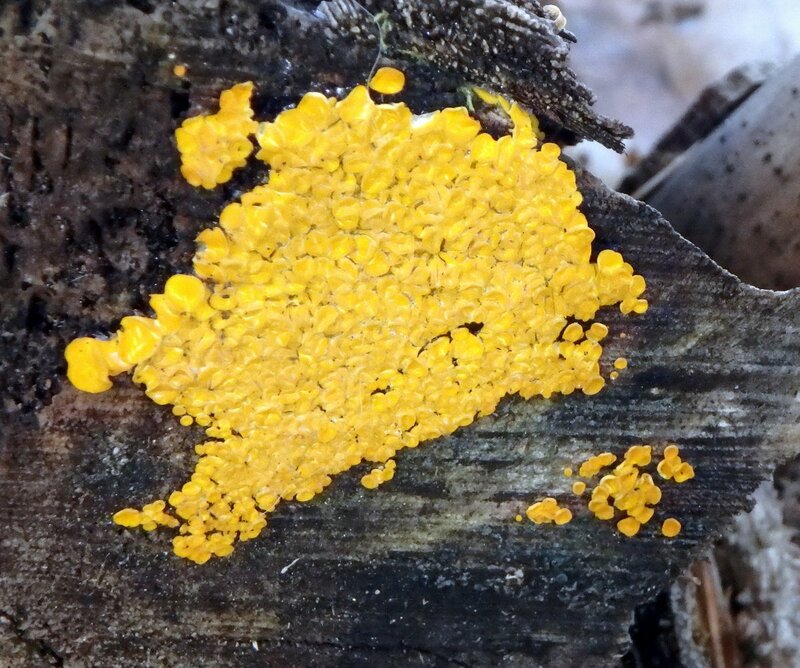 Lemon drop fungi (Bisporella citrina) start life as a tiny bright yellow disc and look as if they lie flat on the log, but they actually hover just above the surface on a short stalk. As they age each disc becomes cup shaped. The Citrina part of the scientific name comes from the Latin Citrin, which means “lemon yellow.” They are very small, so you’ll need a loupe or a macro lens to see them properly. 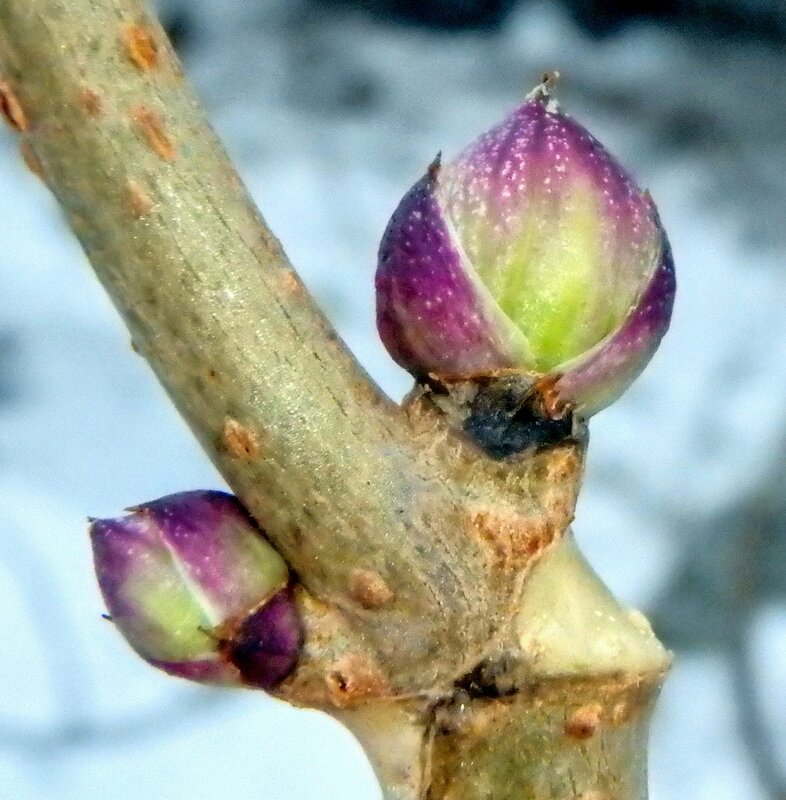 Longtime readers of this blog know that I like looking at buds at this time of year and some of my favorite buds are found on the red elderberry (Sambucus racemosa.) They’re about medium size as buds go, and nice and chubby. I love their beautiful purple and green color combination. 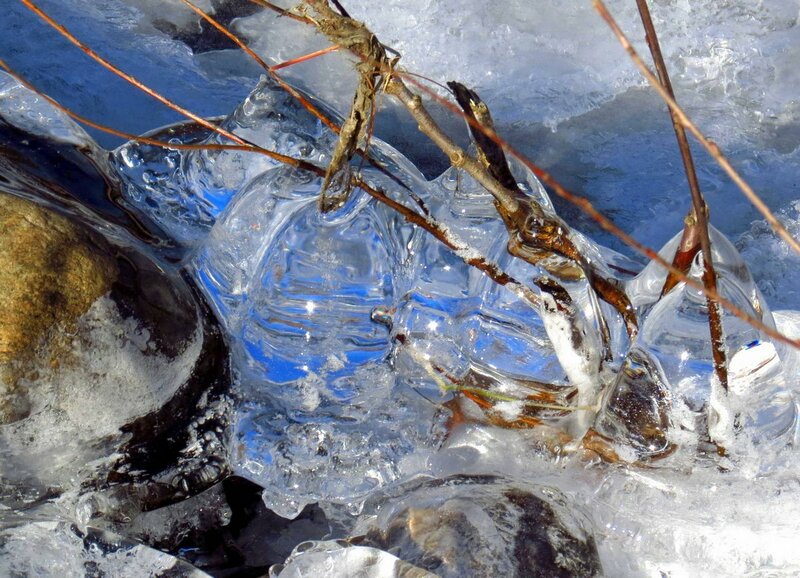 I think my favorite thing this time around is this river ice that caught and magnified the blue of the sky. I thought it was quite beautiful, but blue is my favorite color so that could have something to do with it.